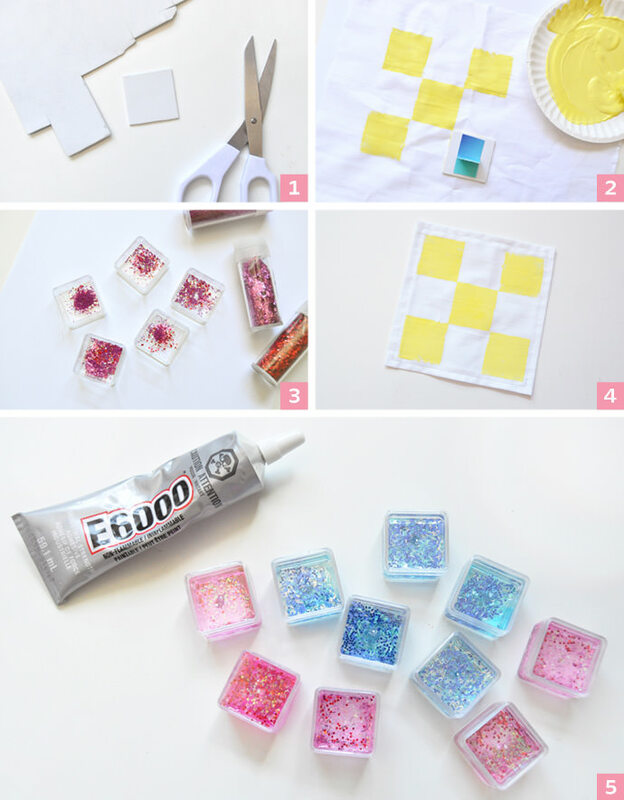 Looking for a rainy day activity? 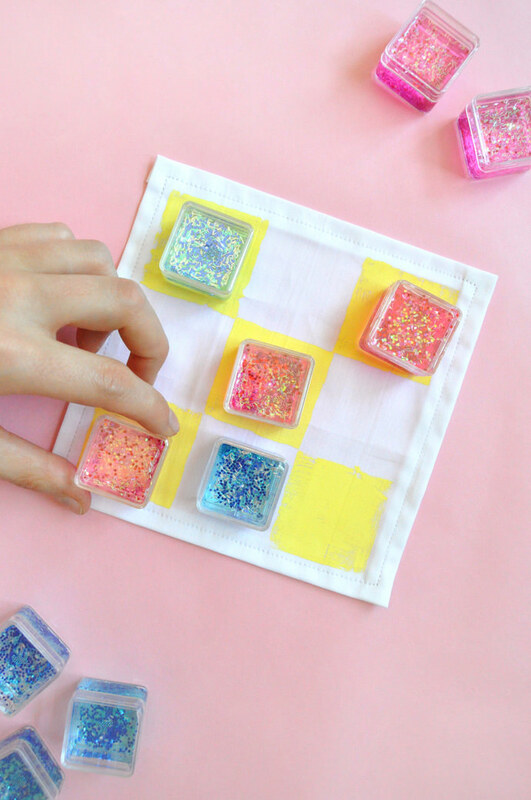 Turn miniature plastic boxes into a fun tic tac toe set! 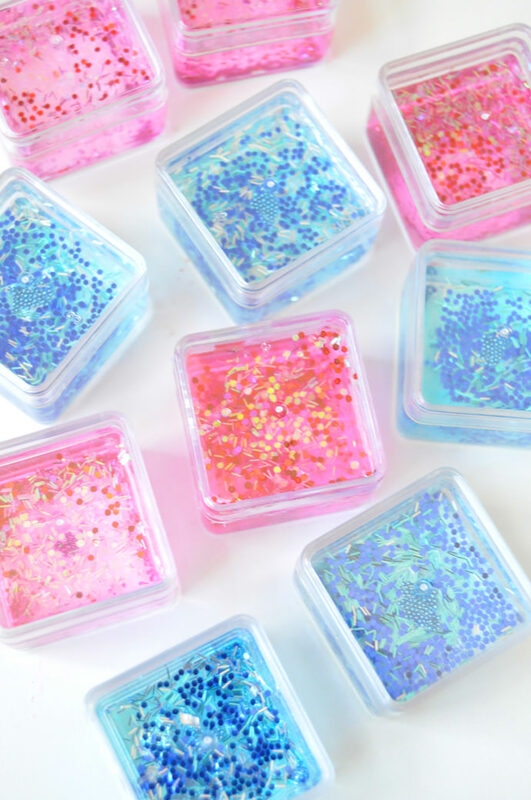 I LOVE the look of the floating glitter phone cases that are so popular now – the swirling glitter is so magical and almost hypnotizing. 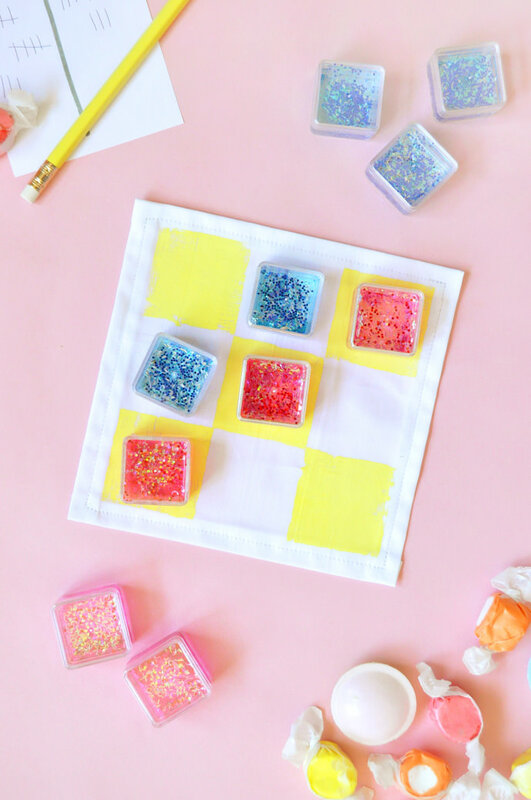 Needless to say, those phone cases were the inspiration for this DIY glitter tic tac toe set. Cut a piece of foam into a square slightly bigger than your plastic containers – this will be your stamp. You can attach a small paper handle onto the back if you like. 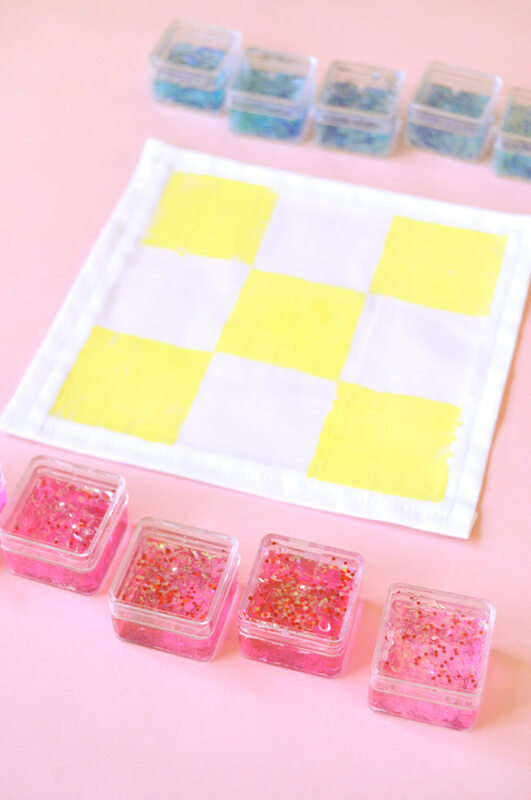 Use the paintbrush to apply paint onto your stamp. Apply onto the white cotton, making a 3 by 3 grid. Let dry. 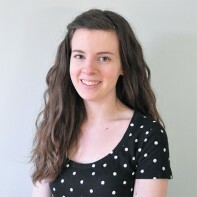 Trim the excess fabric and sew (or glue) a hem around the edge, or leave as a raw edge. 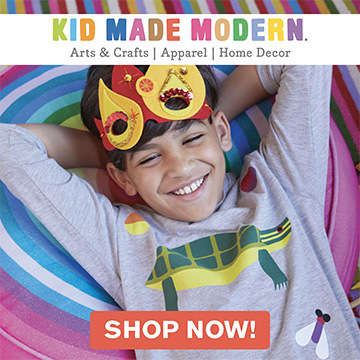 Note: if you don’t want to use fabric for the board, try using felt or card stock instead. 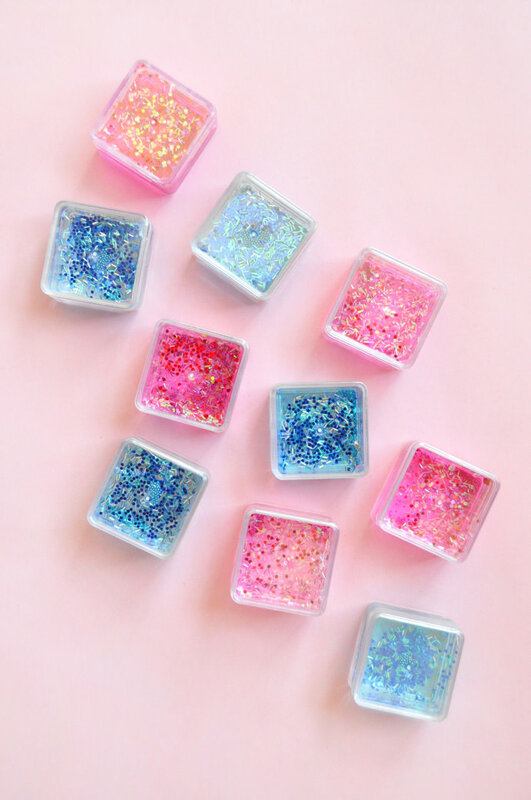 Pour glitter into each container. Since there are 9 spots of the tic tac toe board, each player needs 5 pieces. I made one set a mixture of pink and red glitter, and the other shades of blue. Carefully pour water into each container. 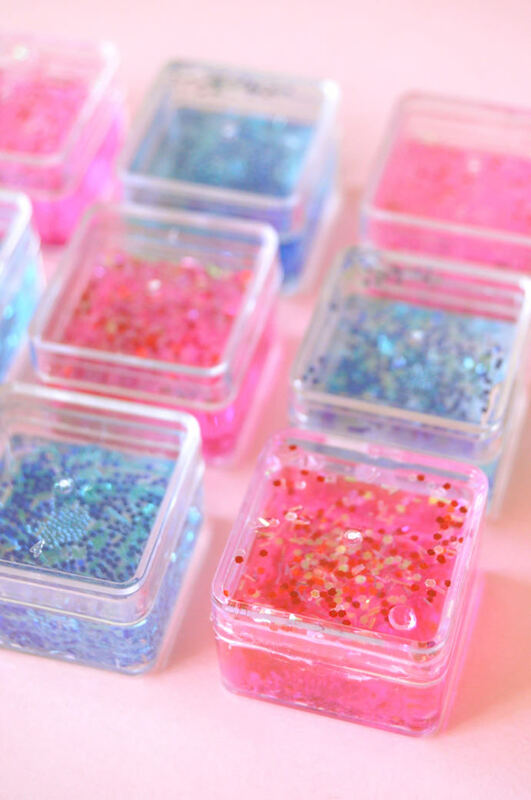 This glitter dyed the water pink and blue on it’s own, but you could add a tiny drop of food coloring if yours doesn’t. 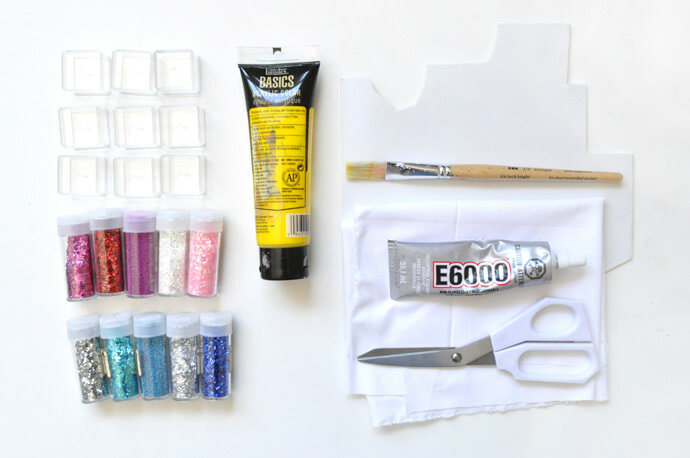 Depending on your container, you may need to glue the lids on to make them waterproof – try E6000 (follow the safety guidelines on the bottle), hot glue, or even tape. Shake to make sure no water leaks out. If you can get mini waterproof containers that would be the best bet!